Abel Sports has experienced increased demand for their custom built Coaches’ Boxes over the last 12 months. Most sporting Clubs prefer the Australian Made coaches boxes because they are designed to offer real shelter to players whether avoiding the wet cold weather in winter or over summer periods protection from the hot Australian sun. The imported shelters, mainly made of aluminium and Perspex have turned out to be like hot houses in the hot Australian summer and unsuitable for Australian conditions. Abel Sports Coaches Boxes, Team Shelters or Dugouts whatever you may call them are available in various lengths and colours depending on the code or Clubs requirements. 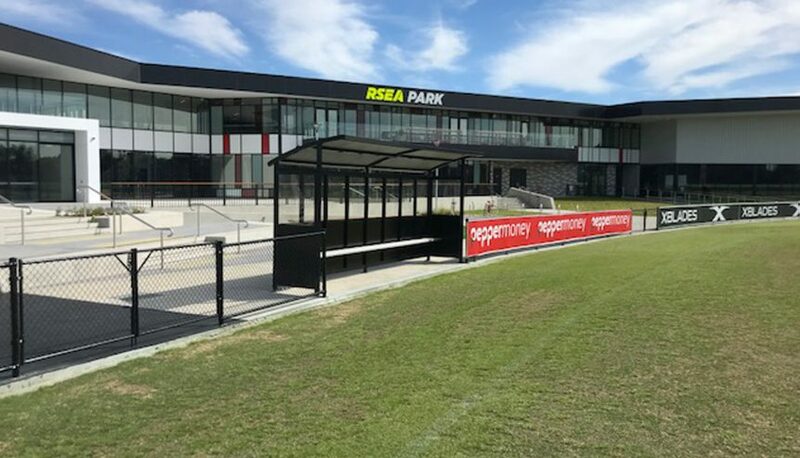 The attached photo shows Coaches Boxes recently installed at St Kilda Football Clubs new training facility at Moorabbin Vic. St Kilda have installed two 6m long Boxes one for the home team, the other for the visiting team. Also a smaller time keeper plus umpire boxes sits between these player Boxes.